If you want to build a SaaS product, you've got to build a SaaS website. If you've got the skills, you can roll your own. If not, there is a growing market of website design companies that are itching to help. They can get your website or online store up and running in minutes, offering templates, hosting, domains, and analytics, all ready to go. Today on Pricing Page Teardown, Patrick and Peter dive into the two leaders in this space—Squarespace and Wix—to look at their different strategies, where each is winning, and what each could be improving in their pricing strategy to win this market. Stay up to date with every episode. Squarespace hit 2 million subscribers in 2017. The New York-based company is now valued at $1.7 billion and is pulling in revenues of $300 million per year. Wix, the younger of the two, went public only seven years after founding. Revenue from the Tel Aviv company pretty much matches Squarespace, with 2016 revenues hitting $290 million. Let's look at how these two are each carving out a part of this market and who might spring ahead in the coming years. On the face of it, Squarespace and Wix offer the same product. You sign up, you choose a design for your website, then they will host it for you at the domain you choose. But these are two very different companies. From the design on their own sites, and particularly the design of their pricing pages, you can see that they are trying to address to different segments of this market. The difference in the two brands is mirrored in the willingness to pay of their respective customers. 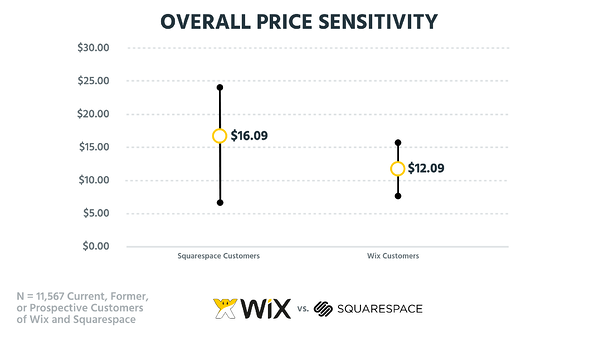 The median willingness to pay for Squarespace customers is 25% greater than for Wix customers. 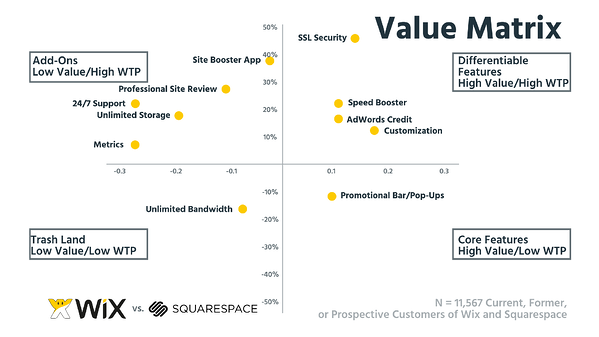 The low points on the range are about the same, but at the higher end, Squarespace customers have a vastly higher willingness to pay—they will fork out about $10 more per month that Wix customers will. Considering they are effectively the same product, this is a huge difference. 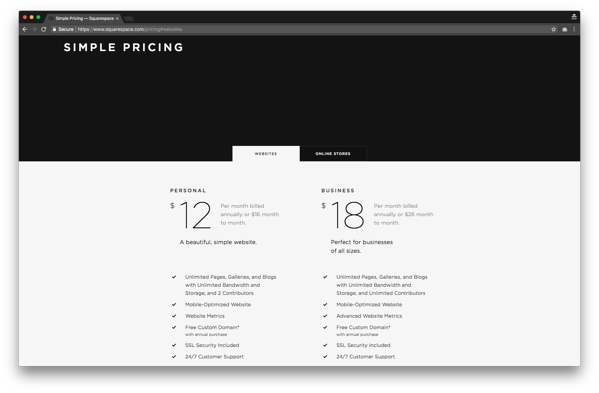 As you can see from the pricing pages, Squarespace isn't offering anything more than Wix. The difference comes down to brand. Squarespace has positioned itself as the premium product, focused on high-end design, and customers are willing to pay more for that design. When a customer isn't generating sales through their website, they don't want to pay for it. 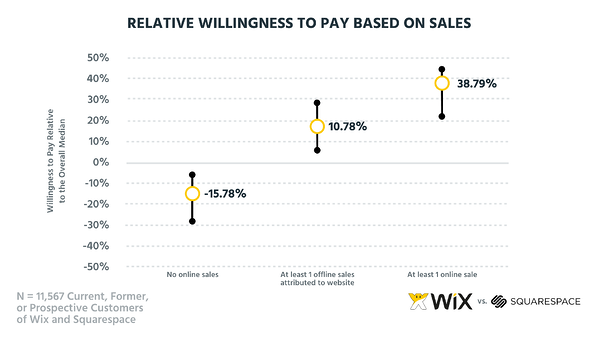 Willingness to pay is over 15% lower when the person sees no online sales. But once they do see sales, either online or offline but associated with the site, willingness to pay goes way up. A customer that gets just one offline sale because of their site will pay 10% more, while a customer that gets just one online say through their website will pay almost 15% more. 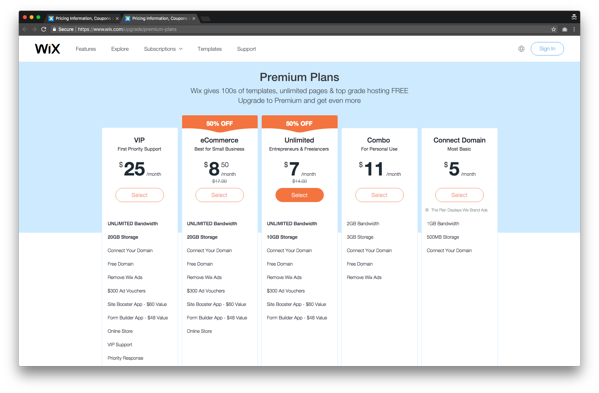 A possible strategy for Wix is then to take advantage of the low willingness to pay and offer a bare-bones free plan (which they already do), but tie the upsell to this success. Once revenue is coming through the site, Wix can upsell the customer for a more comprehensive package. Most upsell packages for SaaS will become more complex as the price rises, adding customization options, analytics, SQL, etc. This is exactly what you don't want to do for web hosting. The people who are most in need of these services are the ones who have no tech ability. They are the restauranteurs and plumbing companies of the world—they just want a site that functions, looks good, and gets them customers. That is why customers with the lowest level of tech savviness are willing to pay up to 41% more than average for these services. 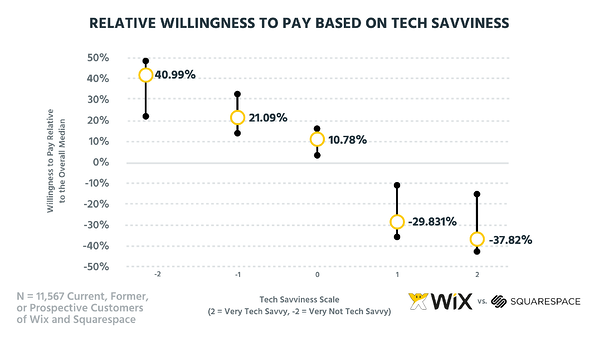 At the other end, people who know how to roll HTML, CSS, and JS together into a neat package aren't willing to pay—their WTP is 37% than average. People with high levels of tech knowledge aren't going to use Wix or Squarespace, and they are definitely not interested in the higher tiers. Any heavy tech or engineering options should just be excised from these pricing pages. We are concentrating on Squarespace and Wix, but this is a crowded market. How can either of these companies, or one of their competitors, win? Trash Land: These are the features that customers couldn't care less about. Here it is unlimited bandwidth. Again, the customers of Wix and Squarespace aren't tech people. They don't know what unlimited bandwidth means. This type of feature just shouldn't even make it onto the page. Core Features: These are the features that customers have come to expect from such a service. The customers here only identified one such feature—pop-ups. They expect that they'll be able to add timely pop-ups, discounts, or overlays to the site. These small customizations that allow them to run their business better have to be available even at the lowest tiers. Differentiable: These are the features you align your pricing tiers with. They are high value (people want them) and high WTP (people will pay for them). Interestingly here, some of these features are already considered core by more tech-savvy people. SSL security is a great example. This should be a core feature of every site in 2018. But Squarespace or Wix could offer this as only an option on higher plans. Speed Booster is another such differentiator. Wix is using this as exactly the differentiable option it can be. You only get to use this (which they say has a $60 value) when you hit the Unlimited, $14/month plan. Add-Ons: These features are nice-to-have. They have low value—not everyone wants them—but those that do are willing to pay highly for the option. 24/7 support is a classic of this genre. You want to have this as something only offered to the people that truly care about it. These tend to be customers that will have a high volume of issues such as enterprise companies, who you can then charge a premium, or customers that are completely new to the service, such as the non-technical customers that might use Squarespace or Wix. The latter two here, differentiation and add-ons are how you can create an entry-level, low-friction pricing option, but still have ample headroom for expansion for each customer. This is how pricing can address the acquisition, monetization, and retention triumvirate. If you were a customer which would you choose? If you were an investor which would you choose? These are the last questions that Patrick and Peter ask. Watch the episode for their full answers. Though Wix is doing well, without the fanfare of Squarespace, it is Squarespace that is playing the long game. Their branding is so strong that they are the dominant contender. But Wix has that opportunity. They are primed to scoop up that lower end of the market. With the right pricing strategy, they could be building themselves off the success of all those customers they acquired through freemium. And as new entrants come to the market, both Squarespace and Wix are going to have to perfect their pricing to make sure they stay the top two.